Canadian folk black metallers Hiverna from Québec have revealed the first details of their upcoming second full-length album “II. Macabre“. Their new work will be released in June 2014 by Oaken Forge, a new label of band’s mastermind Bardunor. Hiverna were formed back in 2006 and after the split “L’Aube Septentrionale” with Chasse-Galerie in 2008, they released their debut full-length album “I. Folklore” in 2010, followed by the 35-minute EP “Hiver, Nostalgie & Amertume” in 2011. 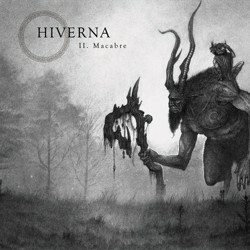 Hiverna have unveiled the wonderful cover artwork of “II. Macabre” painted by Olivier Villoingt, as well as the album tracklist.